Hey, this photo is © TUCCO WEDDING AND EVENT PLANNER. 2016. 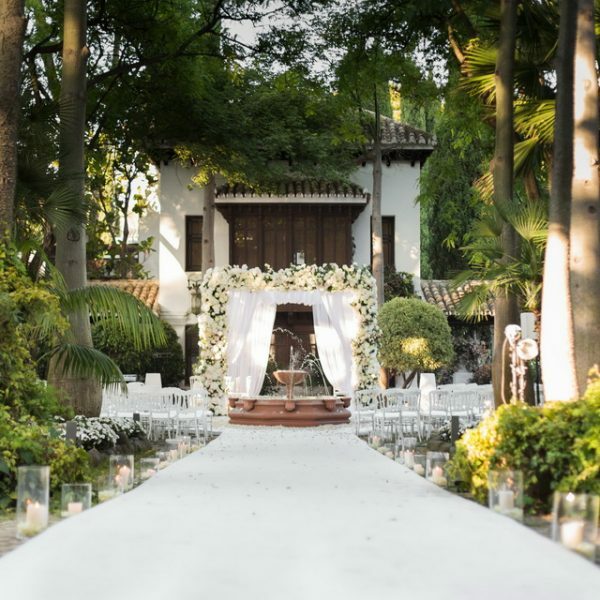 We love working in Marbella because not only we do what we like also we have the chance to organize weddings of different religions and cultures. This time we share with all of you pictures of the lovely wedding of V&H at Villa Padierna Palace Hotel in August 2015. We met V&H in May while we were setting up for another wedding and it was not until the end of June when we met up to talk about their wedding plans and mainly the decoration. We knew exactly what they wanted and with the help of the talented team of Pedro Navarro Event Styling, we all managed to exceed V&H expectations. For the ceremony, a special mirrored table was created to be able to place all the decoration items specially brought from London. All the things where put in the specific location to follow the traditional Persian ceremony. A string quartet played music during the ceremony and reception drinks. For the banqueting, V&H wanted chandeliers over the tables so a special structure was built to be able to support the weight of the heavy and beautiful glass chandeliers. To cover the structure, boj was used, it took two days to have the structure ready as you can see it in the picture. Gold, white, ivory and green where the colours used for the table decoration: crystal chandeliers with candles and hydrangeas, gold charger plates, gold cutlery and glassware and beautiful Damasco table cloths, all the elements were combined to perfection. Thank you so much to all the team of VP for all the help during the planning process and on the day. Also to all the suppliers who were involved to make this day for V&H unforgettable. Thanks to Owen Farrell Photography for the amazing pictures. Real is rare but at the same time extraordinary. Copyright © 2018. All Rights Reserved. Tucco Wedding and Event Planner. Marbella - Malaga - Costa del Sol - Granada - Almeria - Murcia - Barcelona.